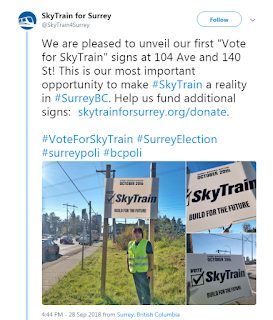 The Peace Arch News is reporting that "The anti-crime community group Wake Up Surrey has apparently made an official complaint to the RCMP calling for an investigation into alleged election fraud. The group says the complaint centres on alleged fraudulent use of absentee ballots and buying votes.” Why is this not surprising? Global has picked up the story. CTV covered the story and posted a video of the coverage. Tom Gill is lying again. That is what Surrey Fist does best. I didn't realize they want to steam roll over yet another park. Surrey First has changed Surrey's motto from the City of parks to the City of parking lots. Not surprisingly the Greenjustice.ca web site has been hacked but the Gangstersout.com web site is still up and running on another server. Welcome to the wild wild west yo. 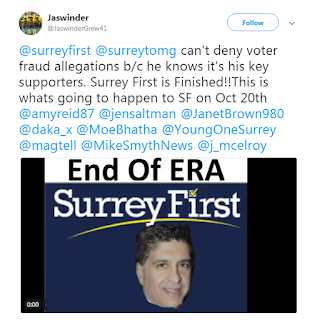 The Surrey RCMP are not going to charge Tom Gill with election fraud any more than they were going to Charge Christy Clark in BC Rail. The original charges in BC Rail were cocaine trafficking and money laundering tied to the BC Liberals. The BC Liberals were never charged after they renewed the RCMP's contract. Likewise, Surrey First has also cut a deal with the RCMP. That's why their new BC Headquarters is in the Green Timbers clear cut. The Surrey RCMP don't want Doug McCallum to win the election because he will get rid of the RCMP. However, officers on the ground will. They will have the first crack at joining Surrey's new municipal force and have great opportunities for advancement. It will be a great way for them to get away from the generations of bullying and sexual harassment from RCMP management. If someone is being threatened to vote for Tom Gill, the solution is simple. Tell them whatever you want but the bottom line is, no one goes in with you when you cast your ballot. No one knows who you actually did vote for. It's a secret ballot. 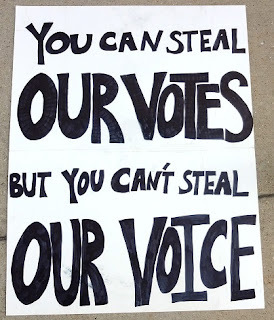 Absentee ballot fraud is serious but that's all the more reason for people to get out there and vote. This one is too important to miss. 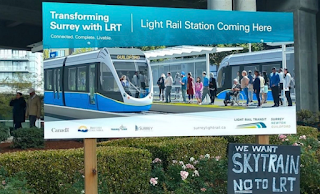 The Peace Arch News is also reporting that Elections BC has directed the City of Surrey to take down all the LRT promotion signs they have plastered all over the city until after the election. That is good news. 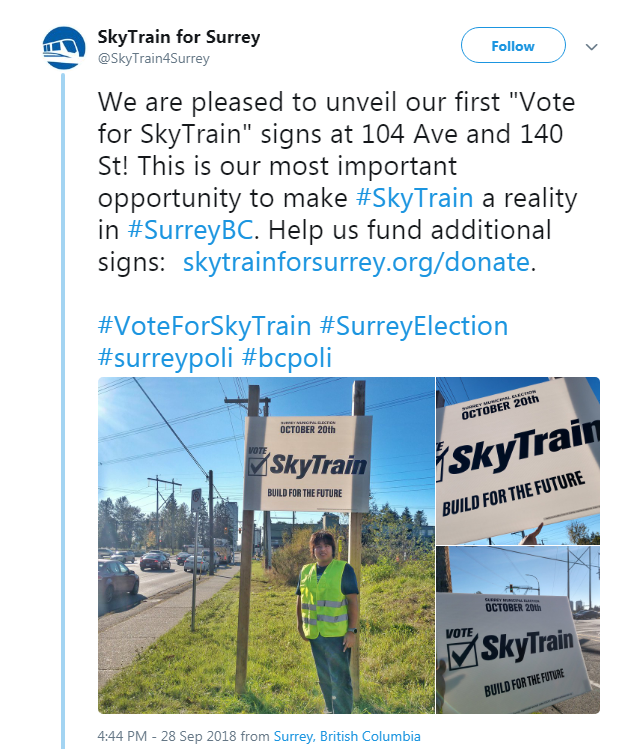 They were using tax dollars to promote their party just like Christy Clark did. Evidently Surrey First is now using robo calls to promote their fail army. 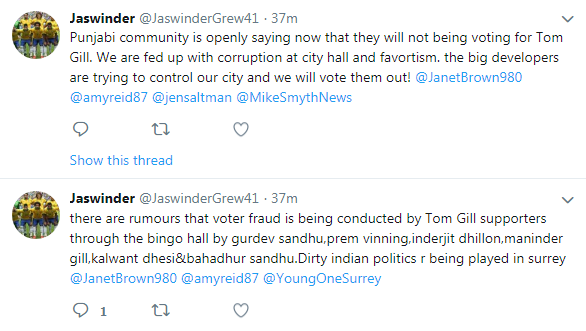 Give it up for Jaswinder Grewl. 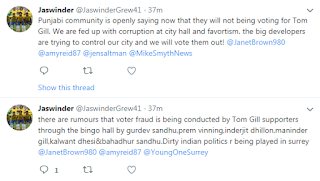 He posted a funny video about Surrey First on Twitter and made some interesting observations confirming the fact that Tom Gill pissed off the entire South Asian community by voting for that Mega Casino on rural land flip they all opposed. LL throw back. Too bad Canadians are so well mannered....most of these people could use a good punch in the face....of course you'd probably wind up in jail for longer than a fentanyl dealer. The thought crossed my mind. I was speaking with an old friend at the mayor's debate and I was surprised there was no security around. Tom Gill was right there in the lobby. I totally could have f*cked him up. I just looked at him and sang the Little Tommy Tinker rhyme instead.